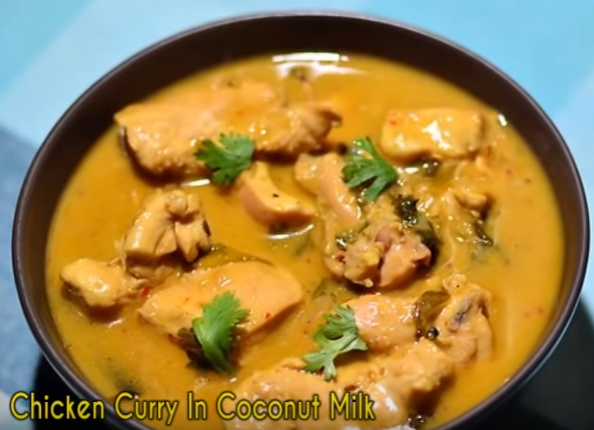 This quick and easy coconut chicken curry is a simple way to liven up the week. Curried chicken simmered in coconut milk and tomatoes makes for a mouthwatering hint! Goes great with rice and vegetables. This simple dish is a fabulous coconut curry from the Coast. Add the onion, chilly, ginger and garlic to a food processor or blender and process until smooth. Add a little water if necessary. Heat the oil or ghee in a large pot or wok over medium flame. Add the onion puree, curry powder, and cumin and sauté, stirring frequently, for 5 to 8 minutes, or until cooked down. Stir in the tomatoes and simmer for 3 to 4 minutes. Then add the chicken, coconut milk, salt, and pepper. Reduce heat to low and simmer, covered, until the chicken is cooked through and tender, anywhere from 30 minutes to an hour. Add more water as needed. Stir in the coriander, adjust seasoning with salt and pepper and serve with rice or chapati. Reserve some of the coconut cream that gathers at the top of the can and stirs it into the sauce at the very end for extra silky results.